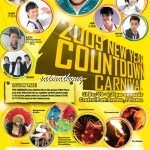 City folks can look forward to a joyful New Year Countdown 2009 celebration as Sungei Wang Plaza in collaboration with MY FM and Kuala Lumpur Chinese Assembly Hall will be organising ‘Street Party Countdown 2009’ on 31st December 2008. The celebration will kick off at 7pm at Jalan Sultan Ismail, in front of Sungei Wang Plaza with colourful cultural shows, fun stage activities, exhilarating concert and exciting fireworks display at the stroke of 12 midnight. 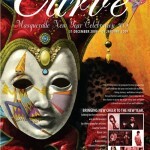 The most entertaining highlight is a concert featuring many international and local Chinese artistes. Edmond Leong will be specially flown in from Hong Kong together with Golf and Mike from Thailand while Malaysia’s Chinese heartthrobs like Nicholas Teo, Danell Lee, Yise Loo, Tate Chan, Wan Qian, Will Ng, Manhand, Hao Ren and Ming will belt out their hits songs to entertain the crowd. 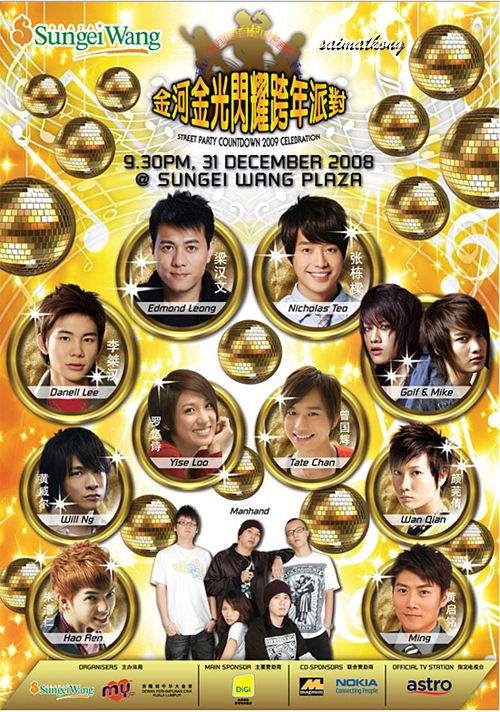 The Main Sponsor of Street Party Countdown 2009 is DiGi with Magnum and Nokia as the Co- Sponsors and ASTRO as the Official TV Station. For more information, please call Promotions and Public Relations Department at 03-2144 9988 or Information Counter at 03-2148 6109.